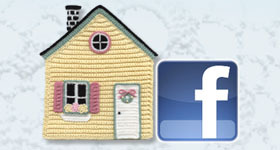 ← Teaching or Taking Crochet Classes? 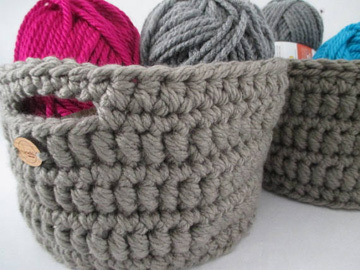 Are you a crocheter who likes to try new and different things to challenge yourself? Do you ever wonder if there are any new crochet stitches or techniques out there? Well, I’m here to tell you that there definitely ARE!!! I’d like to tell you about a new crochet stitch that I think you’re going to LOVE! A few months ago, a new designer on Ravelry named Jen Dettelbach, contacted me and asked about a crochet stitch that she’s been using. She wasn’t quite sure if it was a new stitch or something that has already been used. She contacted CGOA (the Crochet Guild of America) and CYC (Craft Yarn Council) about her stitch and one of them suggested that she contact me. After looking at Jen’s stitch and understanding what she had done, I realized that I had never seen a stitch like Jen’s! I decided to ask Edie Eckman about it, just to make sure. She hadn’t seen it either and suggested that we ask Dora Ohrenstein about it. So I contacted Dora about the stitch and she hadn’t seen it either! Without further ado, let me introduce you to Jen’s “Bolster Stitch”! 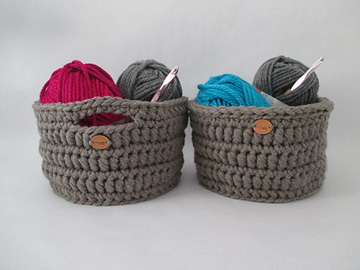 These are some cute crochet baskets that Jen Dettelbach has designed. She sells the finished baskets and patterns, in her Etsy shop here. Jen uses her Bolster Stitch in these baskets, which gives the baskets more stability so they don’t fall over and lose their contents. Jen’s stitch is NOT a post stitch or bullion stitch, although it looks similar to these stitches. 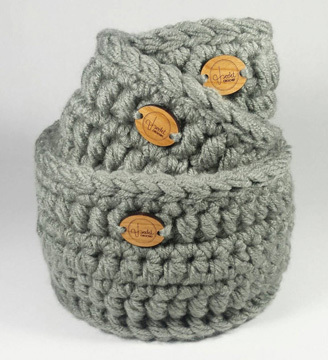 To find out more about Jen’s Bolster Stitch, check out her blog/website here. It’s so exciting to see a new crochet stitch and enjoy the creativity of other crochet designers! Over 10 years ago, I invented a new crochet stitch that I call an “Anchored Dc”. I invented it for use in Mosaic Crochet so the stitches wouldn’t flop around if more than 1 vertical stitch was crocheted in a row. I’ve used it in several designs over the years. 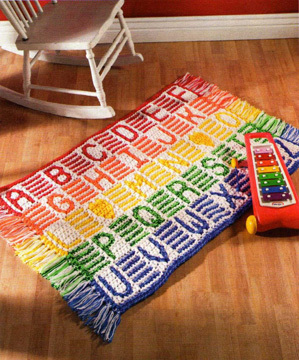 One of these was my ABCs Rug, which was published in the August 2007 issue of Annie’s Hooked on Crochet magazine. 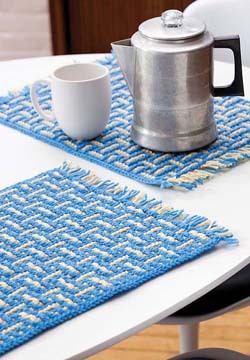 Another was my Mosaic Basketweave Placemat. It has been published in 2 places. The first is in the Leisure Arts book #6321, “Crochet Beyond the Basics”. You can see most of the projects in this book here. The other is on the Red Heart website here. 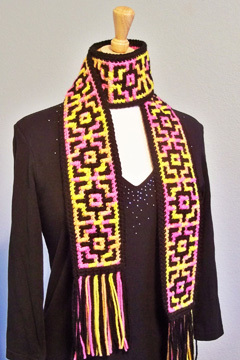 I also used my Anchored Dc in a crochet pattern that I self-published in 2015: my “Crochet Mosaic Scarf”. You can see more about this pattern here. I really enjoy playing around with crochet and seeing what I can come up with! And I enjoy sharing my designs with other crochet enthusiasts like YOU! I hope you’ve enjoyed this look at 2 new crochet stitches! 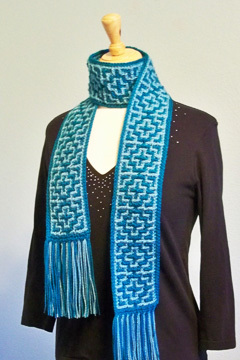 This entry was posted in Learning something new, New crochet stitch and tagged crochet stitches. Bookmark the permalink.